Austin A40 Farina official accessories, 1960. Homepage. 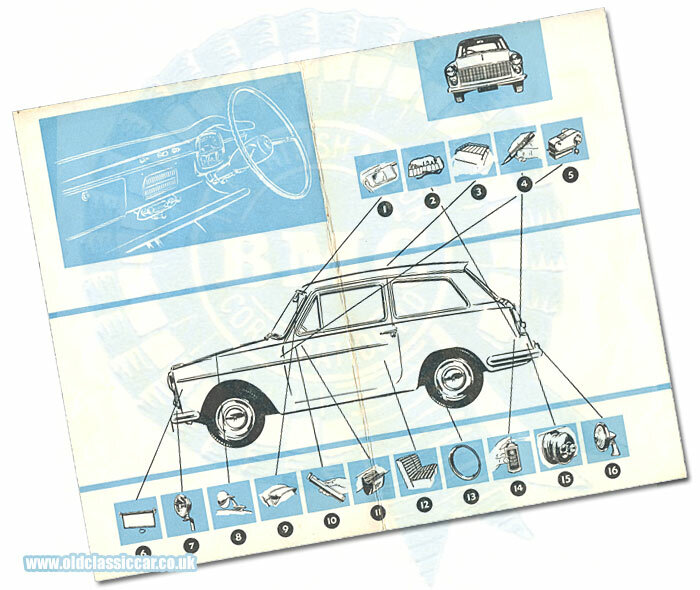 This page: The factory-approved BMC accessories list for the Austin A40 Mark One in the 1960s. The A40 Farina was introduced in 1958, and is an interesting combination of sleek (compared to the A35) Italian two-box saloon styling, coupled with tried and tested running gear that could trace its roots back to the A30's launch, in 1951. My own example was built in 1960, and has been in the family since that time. 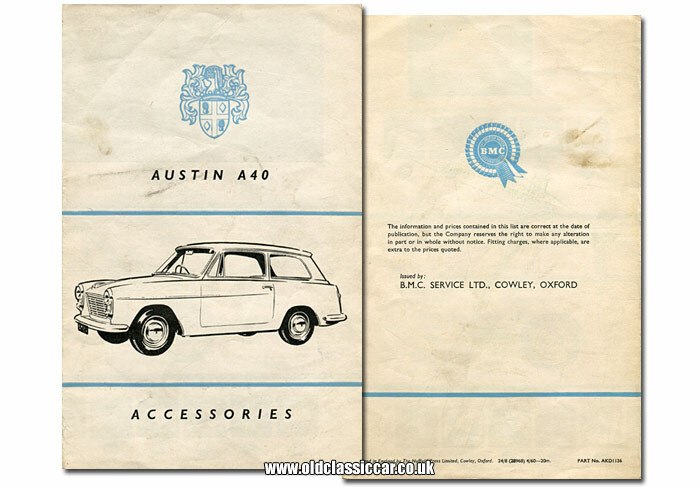 This leaflet, "Austin A40 Accessories" (Publication no. AKD1136), is also from that year, so relates to the Mk1 only. No A40 was overly-blessed in the equipment stakes, buyers had the option of choosing the standard car, which didn't even have opening rear side windows, or bumper overriders, or instead the slightly better equipped "De Luxe", which did have a few extra mod cons. Despite this, there would be plenty of opportunity to improve on even the De Luxe's modest specification, and buyers in 1960 could well have been tempted by the BMC-approved accessories on offer in this leaflet. The cover features an illustration of a very early Austin A40 Farina Mk1, identifiable by the stylised "Flying A" (for Austin) incorporated into the centre bonnet strip. A look at the rear of the car would also reveal a single, domed, numberplate lamp in the centre of the bumper (later cars have no "Flying A", and a wider numberplate lamp). The rear cover gives the location of BMC Service Limited, situated at Cowley rather than the home of Austin, Longbridge. Within, the reader is congratulated on his or her investment in a brand new A40. CONGRATULATIONS! You are now the proud owner of our new Farina-line Austin A40. If you have bought your own house, then this is probably the second major investment of your life and, like your house, is worth spending a little extra money on - don't you agree? Then why not fit BMC Approved Accessories? We realize that you will have your own personal preference of the accesories you will need, and to help you in your choice we list the 16 most suitable if you desire to further enhance the appearance, comfort, and safety of your car. All you have to do is to indicate your requirements to your Austin Distributor or Dealer and he will be happy to carry out your wishes. Remember, always ask for BMC APPROVED ACCESSORIES. This simple precaution is your safeguard that your car is fitted with quality products, approved bythe engineers who developed and produced your car. A handy illustration points to the top 16 aftermarket accessories that BMC were keen for you to fit, followed by their descriptions. In all, including the switch for the reversing lamp which is separate, the list actually contains 17 entries. 8. Wing mirror (ratchet type). 9. Exterior sun visor (with radio aerial). 10. Fire extinguisher (9.5 x 1.5). 13. Wheel trims (set of 5). Prudent buyers were also offered the option of BMC Underbody Seal, and were reminded that their local dealer also held many more items with which to accessorise their two-door "Farina-line" Austin. From that list, I now know that my own A40 came with options 2, 5, 7, 8, 15, and 16 (although not of the style shown here). Other early A40 Farina content on the site includes a selection of period A40 Mk1 photos, and a leaflet describing the hotted-up A40 on offer from Speedwell Performance Conversions. If anyone can point me towards new BMC front wings for a Mk1, please get in touch (driver's side especially).